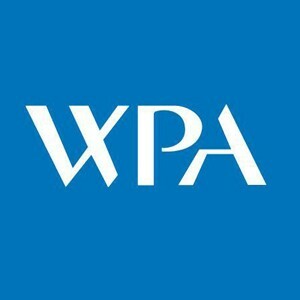 Consultant Podiatric Surgeon working in London and Reading & external specialist for the Parliamentary Clinical Ombudsman. Current board examiner & former board member / regional dean for the South of England in the directorate of Podiatric Surgery. Podiatry is a branch of medicine devoted to the study and treatment of disorders of the foot, ankle, and lower extremity. Podiatric Surgeons are not registered medical practitioners (medical doctors) but are Fellows of the College of Podiatric Surgery and are dedicated foot surgeons. I present audit on the outcome of surgery and hold full indemnity insurance. I am a recognised specialist and have recently retired from the NHS having held an NHS Consultant post for more than 20 years. As a consultant Podiatric Surgeon I continue to operate on both NHS and private patients in the private sector. The quality and outcome of my work is scrutinised within clinical governance and I lecture routinely to colleagues and other health care professionals. The documents below give information on the training and expertise required to become a podiatric surgeon, and my own professional history. This includes years of academic and clinical study. Recent changes in legislation have allowed podiatrists to prescribe all relevant prescription drugs after appropriate training, a process that I have completed. Steve qualified as a Podiatrist in 1982 in Manchester. On completion of his studies he moved to London taking up a post at City and Hackney District Health Authority working at St Bartholomews and Hackney Hospitals. He took a keen interest in the diabetic and rheumatoid foot and became involved in a number of collaborative research projects with other hospital departments. He also lectured to local GP`s and lay groups on routine foot care and the management of the foot complications of diabetes. In 1982 he began a part time course in Traditional Chinese Medicine qualifying as an acupuncturist in 1985. 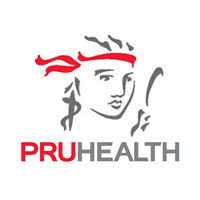 He was subsequently appointed as acupuncturist to the Rheumatology Department at Barts Hospital treating a variety of musculo skeletal and pain syndromes as part of a multidisciplinary team as well as his continued practice as a podiatrist. In 1985 he began a Masters research degree based at The University of Westminster and Northwick Park Hospital. He established a multi centre clinical trial looking at the investigation and management of plantar fasciitis. His thesis on Heel Pain: An Investigation into its aetiology and management was submitted and accepted by the Council for National Academic Awards for an MPhil degree in 1990. During this period he continued to develop his skills as a Podiatrist gaining seniority within his department. In 1988 he was appointment clinical chief of the district. He continued to lecture to healthcare professionals on foot related topics. After completing his Masters degree he travelled abroad returning to the UK in 1992. He was appointed as a part time clinical tutor in Podiatry at the University of Westminster. Steve also worked within a variety of GP practices and Hospital bases and took a post at the Royal Free Hospital as Podiatrist to the Orthopaedic and Rheumatology Departments. During this period he developed an interest in foot problems associated with Scleroderma and connective tissue diseases as well as general Rheumatology. He was also appointed as acupuncturist to the Rheumatology Department at the Royal Berkshire Hospital NHS Trust (Reading) in 1994. He now focuses on foot surgery, foot biomechanics and the management of a wide variety of foot problems with a keen interest in Rheumatoid foot surgery. 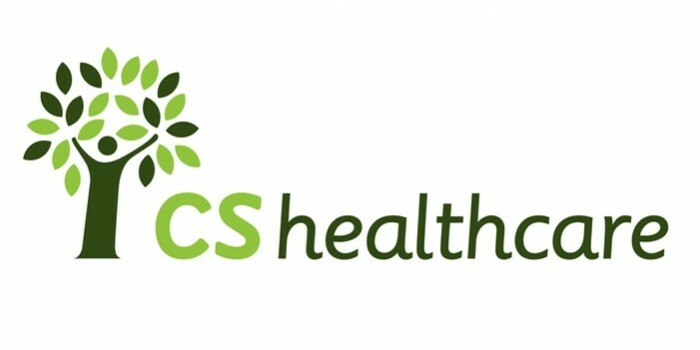 Having held a Consultant post within the Royal Berkshire Foundation NHS trust for 20 years he is now retired from the NHS and has private admitting rights at hospitals in Reading and London. 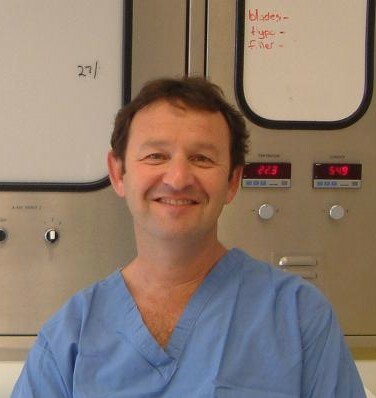 He has been involved in a number of media and educational projects including a training CD on foot surgery and has recently been on Radio 4 casenotes. He is on the advisory board of the British Journal of Podiatry. He regularly lectures to GP`s hospital consultants, physiotherapists and lay groups on the foot. Podiatric Surgeons are NOT registered medical practitioners (medical doctors) but are Fellows of the College of Podiatric Surgery and are dedicated foot surgeons. I present audit on the outcome of surgery and hold full indemnity insurance. 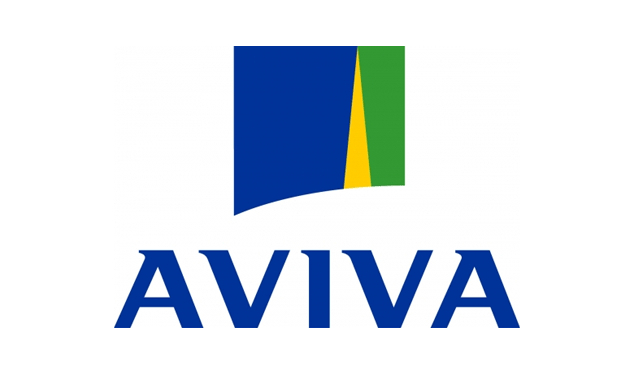 I am a recognised specialist with all of the main insurance companies and held an NHS Consultant post. Possibly the commonest forefoot problem encountered by podiatric surgeons is the painful bunion joint. The variety of ways in which this deformity presents, together with the technical considerations and difficulty in its management, pose a significant clinical challenge. The level of deformity does not always match the amount of pain that people experience. Some people have very marked bunion deformity but very little pain and the converse is also true. Exactly why this should be is difficult to explain. There are numerous bunion operations, some of which I will detail below. There are also non surgical treatments but realignment of the joint is only realistically achievable via surgery. 'What causes bunions?' This is a question I am asked very frequently. My response, is that it is probably a combination of factors. There is no one specific cause that might explain how a bunion develops. When people say that it 'is in the family' this is probably because the mechanical predisposition runs in families. This could be related to very mobile flat feet, the relative pull of muscles and tendons acting around the big toe joint and intrinsic foot muscles, and of course shoes. Footwear is not the only cause of a bunion deformity but clearly plays a role. Men get bunions and tend to wear wide shoes so it cannot just be footwear. When there is pain and deformity, you are an obvious candidate for corrective surgery. When there is no pain but obvious forefoot deformity affecting mobility, surgery is a reasonable option however, operating on a non painful bunion joint has risks and careful evaluation of the need for surgery is required. In some cases it might be appropriate to consider conservative management initially. This could be best suited for children, or for people with no pain and mild deformity. There are numerous gadgets regularly advertised that claim to straighten the bunion joint. I am unaware of any research that has shown that they work. The only product that is worth trying would be a custom orthosis. These are made to measure insoles that might slow down the progression of the deformity but will not stop the bunion deformity worsening. In many cases they are an interim measure until surgery takes place. 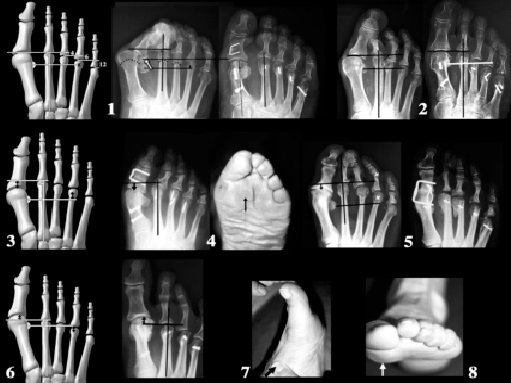 Once the decision has been made to address the deformity surgically, clinical and radiological evaluation is needed in order to determine the best bunion operation. Factors that influence this decision include the level of the deformity, (ie how bad is the bunion deformity), whether there is arthritis in the joint and the quality of the bone. Other factors such as the age, health, and mobility must also be put into the equation. Over the years numerous surgical procedures have been described. As techniques and equipment improves the post operative recovery gets shorter and the outcome of surgery improves. In general the greater the deformity the more complex the surgical procedure that is required. For most people the Scarf Akin procedure provides excellent correction with a fast recovery. If the deformity is marked other procedures eg The Lapidus procedure might be required. If the problem is simply a very small prominence of bone this can be shaved off and after just a few weeks you should be back to normal. This is probably the simplest bunion procedure and involves removal of the bony prominence of the big toe joint. Since bone has not been cut and realigned there is no requirement to wait for it to knit back together. In this case you should be back into a normal shoe after 2 weeks. 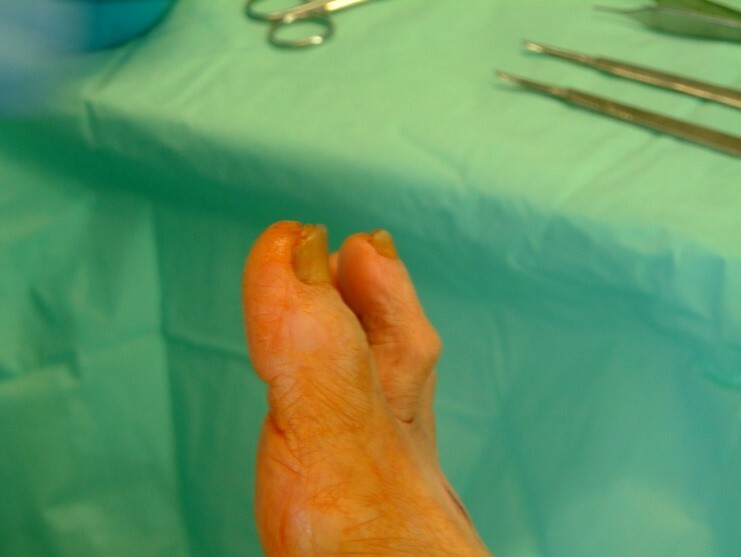 This procedure however is not for most people presenting with a bunion deformity as the correction is minimal. Possibly the most common procedure that I carry out for bunion correction. 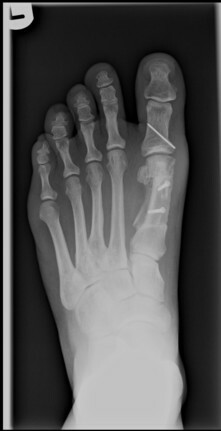 This is a cleverly designed bunion procedure that is versatile and allows for good correction of the deformity. It involves surgery to the 1st metatarsal and big toe to achieve good alignment. The beauty of this procedure is that it allows for early weight bearing (48 hours) and there is no need for crutches or a plaster cast. You should be able to get into a comfortable shoe within 4 weeks and a relatively rapid return to normal activities. 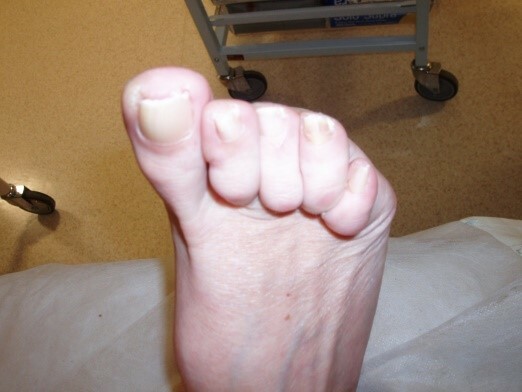 This is generally reserved for people presenting with a large bunion deformity. It is also indicated for people who develop a bunion deformity at a young age or for those with a mobile flat foot. 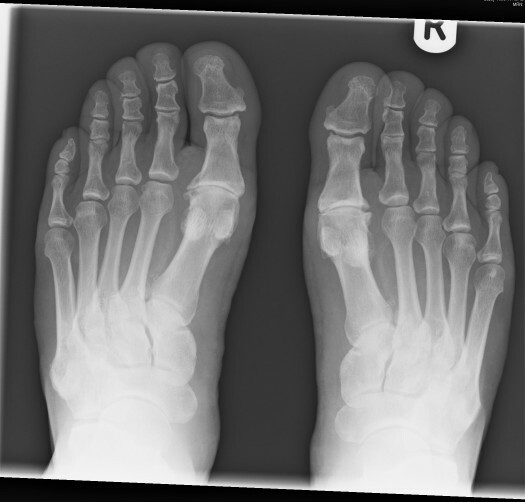 In this situation fusion at the base of the first metatarsal is required. This operation can correct a large deformity and prevent early recurrence. With new fixation technology most people are able to weight bear after 2 weeks in a removable boot and back into a normal shoe at 6 weeks. 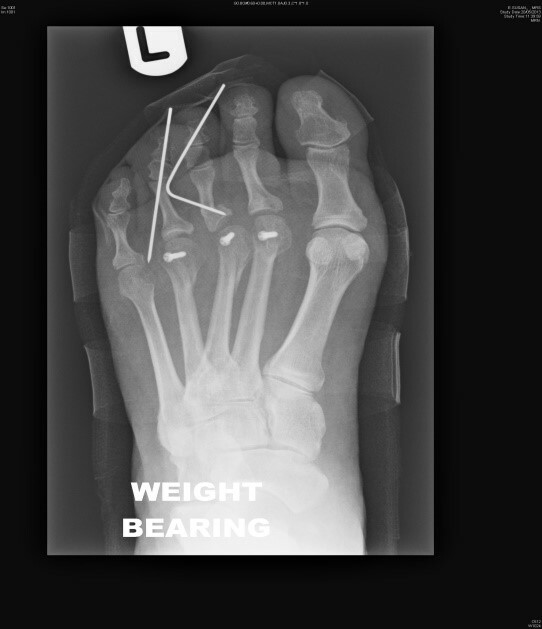 Large bunion deformities can be corrected with this procedure and with new plate technology weight bearing is achievable more quickly. These procedures can be done according to your preference. Some people choose to have this done under a local anaesthetic and sedation others may wish to have a general anaesthetic. Generally people go home the same day. It is simply not true that all bunion surgery is painful. With new techniques, a good local anaesthetic blockprior to surgery and the appropriate use of pain killers most people have surprisingly little pain after surgery. As techniques improve recovery from bunion surgery is quicker without the need for plaster casts or crutches for most people. Expert local anaesthetic techniques, prior to surgery significantly reduces pain following surgery. Recurrent deformity can occur but is minimized via the correct selection of the appropriate surgical procedure to address the presenting complaint. Not all bunions are the same and there are a variety of surgical procedures to realign the joint to resolve pain and improve shoe options. When a nail is cut incorrectly or due to trauma a small spicule of nail will penetrate the flesh and cause the redness and pain associated with an ingrowing toenail. This is because the body is trying to expel the nail, which it recognises as a 'foreign body'. Often the wound becomes infected and will improve with antibiotics but usually until the nail spike is removed the problem will persist. Occasionally removing a small piece of the nail will solve the problem but usually a wedge of nail needs to be removed under local anaesthetic. This involves a local anaesthetic given into the base of the toe. Once the toe has gone numb the procedure will be pain free and generally there is very little pain afterwards. A wedge of nail is removed and the root of the nail destroyed using a strong chemical called phenol. This should prevent the nail wedge from regrowing. The chemical is washed out with alcohol and the toe bandaged. Please come to clinic with a slipper or sandal big enough to accommodate a large bandage. The procedure takes about 15 minutes and you should be able to go home straight afterwards. You will be able to return to normal activities after 24 hours but the wound will take about 8 weeks to heal. 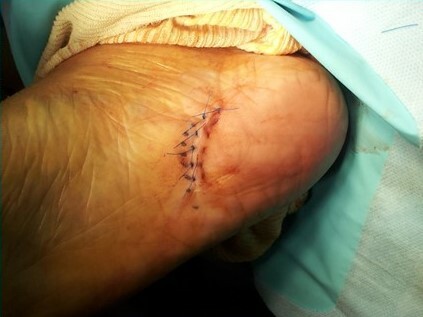 This shouldn't stop you from wearing normal shoes and exercising soon after surgery. This common condition is the cause of significant pain and disability. A painful big toe joint with reduced range of motion will affect the way you walk and is often the source of pain on the outside of your foot and possibly ankle and knee pain. 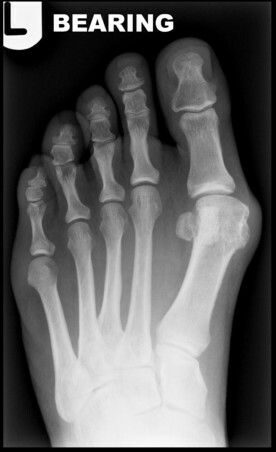 Arthritis of the big toe joint is commonly due to a combination of biomechanics and trauma. This can be repetitive, or occasionally, people recall a single incident that they believe precipitated the painful joint. As with osteoarthrosis of other joints, there is often no obvious cause. 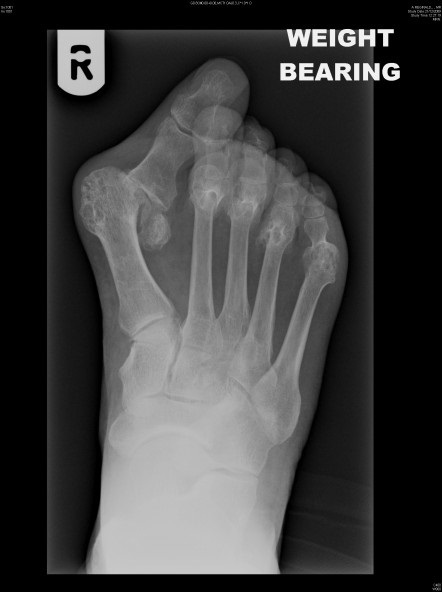 X Ray may reveal a relatively long first metatarsal. Clinical examination may demonstrate a hypermobile foot. Other causes of pain in the big toe joint include inflammation of the joint capsule and occasionally gout. The non-surgical management of an arthritic big toe joint often involves a combination of shoe modification, orthoses, physiotherapy and steroid injections. The benefit from conservative measures depends on the level of mobility and pain. If the range of motion is reasonable shoe modification such as wearing a stiff soled shoe may be of benefit. When there is inflammation of the soft tissue around the joint and the arthritis in the big toe joint is minimal manipulation under anesthetic and steroid infiltration into the joint may relieve symptoms and delay surgery. Repeat steroid injection is contraindicated in a relatively preserved joint as this will lead to more speedy degeneration of the articulating cartilage. A series of physiotherapy treatments employing manipulation and pain relieving techniques(ultrasound,laser) may be of benefit. Orthoses can play a major role in force redistribution and can be attempted in early onset of pain and reduced joint mobility. When these modalities do not resolve the pain or restore function to the foot then a surgical solution may be required. The main criterion for surgical management is pain. Osteoarthritis within the big toe joint often presents as a painful bony prominence that rubs on the shoe along with painful restricted motion of the joint. Frequently however, people present with stiffness of the joint but no discomfort and the indications for surgery depend on the extent of the arthritis and symptoms. The history and level of pain are vital in choosing the correct surgical approach. Removal of the bony prominence (Cheilectomy) may resolve the discomfort from footwear but might generate pain within the joint by increasing the range of motion. The surgical objective must therefore be to preserve the joint where possible but to recognize the need for joint destructive procedures when necessary. The commonest surgical procedures for significant osteoarthritis of the first MTP joint are Cheilectomy, Keller arthroplasty, decompressive osteotomy, Big toe joint arthrodesis/fusion and joint implant surgery. Occasionally people present with a thickened big toe joint with restricted motion and a bony prominence on top of the joint. In these patients the bony prominence rubs on the upper part of the shoe and causes pain whilst the joint itself is asymptomatic. In this situation simple removal of the dorsal "bump" may cure the problem. The aim of a simple cheilectomy is to remove the bony prominence without affecting the joint. This relatively straightforward procedure can bring early pain relief and patient satisfaction. If there are obvious biomechanical issues causing pain then these must be addressed. This was described by Keller in 1904. This procedure involves removal of the arthritic joint leaving a gap between the big to and the metatarsal bone. This is a good procedure when used for people who fulfill specific criteria. The indications for the Keller arthroplasty are for people who have a painful deformed big toe joint with evidence of significant degenerative changes. The amount of bone removed from the big toe is critical. 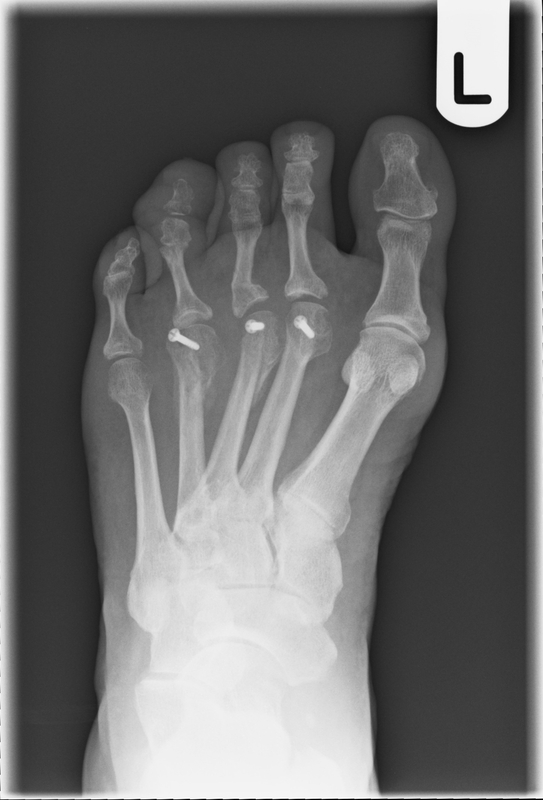 Excessive bone removal leads to shortening of the hallux (big toe) and reduction in hallux purchase of the ground. As the hallux has a major role in propulsion and takes approximately 80% of digital load, this can have a significant affect on foot function. If inadequate bone is removed, the hallux may abut the metatarsal head and the joint will continue to be restricted and painful. In the appropriate candidate the Keller arthroplasty continues to be an excellent procedure giving pain relief and rapid post operative recovery. The principle behind the decompressive osteotomy is to open the joint space between the head of the first metatarsal and base of the big toe. This decompression will allow for an increased range of motion at the big toe joint and resolve pain. 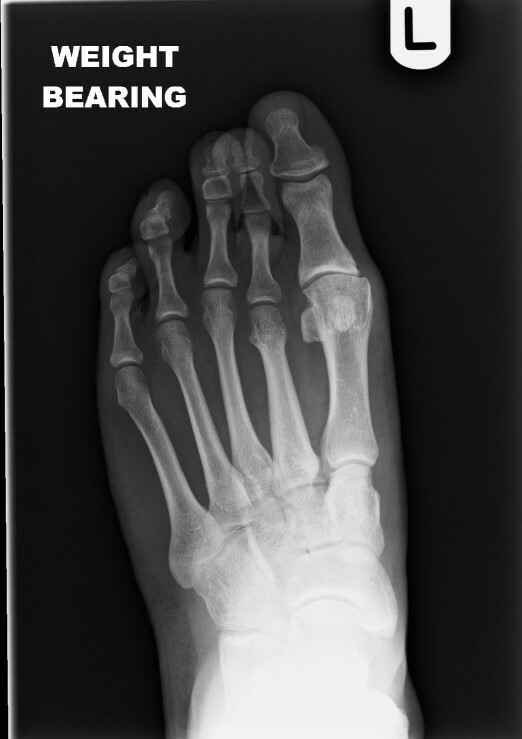 The most obvious indication for this procedure is when there is clear radiographic evidence of a long first metatarsal with minor to moderate arthritic changes at the big toe joint. 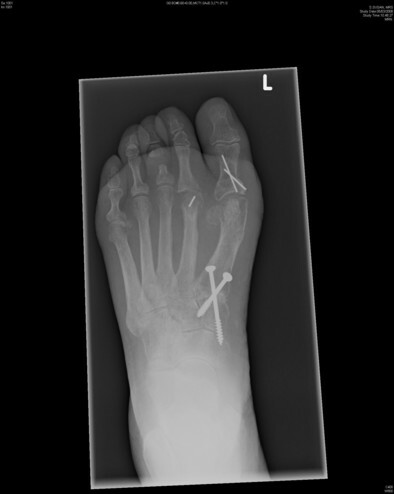 In this procedure a wedge of bone is removed from the 1st metatarsal thus shortening the length of the first metatarsal and increasing first MTP joint range of motion. Fusion/Arthrodesis of the big toe joint is a common procedure indicated where the arthritis in the joint is advanced and the pain significant. The procedure involes removing the arthritic joint and fusing the bones together using an internal plate or screws. This will bring about pain relief but the joint will be fused and not move. For some people, especially women who like to wear high heels there may be some difficulty with accommodating this type of foot wear but in normal shoes the foot copes well and the outcome of this surgery is normally good. An alternative to fusing the joint is to have a silastic joint spacer. This is a small gel like spacer placed in between the big toe and 1st Metatarsal. The benefit of this procedure is a mobile joint and a relatively quick recovery. There are many different joints available but the one I use has been available for many years and is the NICE recommended joint. The video below demonstrates a joint replacement procedure. Please only view this video if you wish to see a surgical procedure. There are a variety of procedures available to address a painful osteoarthritic big toe joint. These range from conservative to surgical procedures and from non joint destructive procedures such as cheilectomy and joint decompression to removal of one or both articulating surfaces via the Keller, fusion and silastic implant procedures. The level of deformity, state of the articulating cartilage, your health and mobility will help to determine the procedure of choice. Deep heel pain is a very common foot problem that can occur at any age and although often associated with sport often occurs after no history of high activity or trauma. The central heel pain can in some people be a minor nuisance but in others can affect their lives in a major way. In 1990 I submitted a Masters Thesis on the cause and management of heel pain and not much has changed in our understanding and treatment of this common condition since then. The arch of the foot is supported by a large broad band of tissue called the plantar fascia or plantar aponeurosis that runs from the heel bone to the ball of the foot. It is divided into 3 bands with the central and medial (inside) portion being the strongest. With weight bearing, the foot flattens and the fascia stretches. Sometimes this overstretches and in time this can damage the origin of the fascia into the heel bone. With continued stress on the aponeurosis it can become partially ruptured from the heel bone and this is the cause of your pain. Classically pain is often worse on first weight bearing in the morning and after rest. In most people the pain improves with gentle activity only to worsen towards the end of the day. The pain is often a deep aching sensation but can in some people feel very sharp. It is normally felt either under the heel or on the inside of the heel by the arch area. For most people there is no specific cause. It seems to occur after no particular activity. In some people there is a mechanical cause ie foot posture or trauma. Being significantly overweight is thought to be a common cause. Some people who do a lot of impact sport can damage the heel bone or even tear the tendon but symptoms are slightly different in this group of people and there is often a specific traumatic event. The fascia becomes partially detached from the heel bone with localised inflammation which causes pain. For more information on what fascia actually is, Wikipedia is quite enlightening. The expectation is that the pain will go within about 18 months. In many people it might last just a few weeks. It is impossible to predict how long the pain will last for each person and there are things that you can do in order to help with the pain and ease symptoms. You could wake tomorrow pain free. In those people where the pain doesn’t fit into the accepted pattern or differs in nature or lasts more than 18 months it might be necessary to arrange for an MRI or Ultrasound scan to image the fascia. In the vast majority of people no investigations are required. 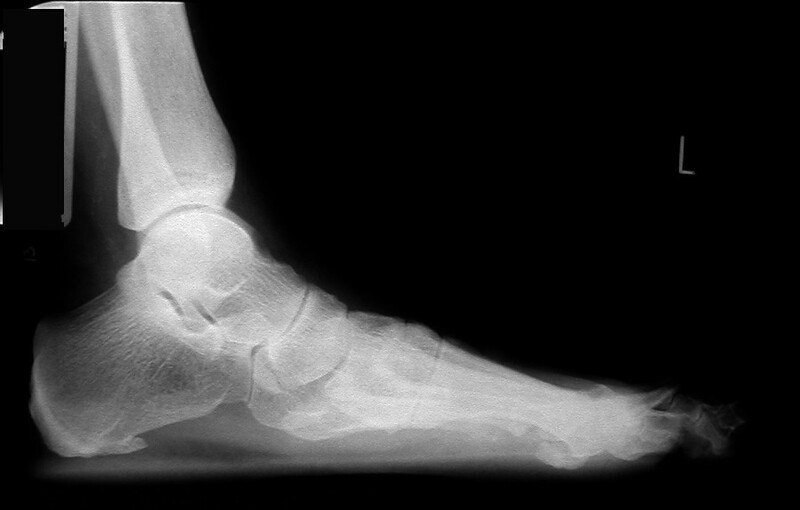 The finding of a plantar bony spur which is seen on X Ray under the heel is irrelevant. Where it appears to be a standard mechanical heel pain the diagnosis is normally made in clinic. Occasionally blood tests might be arranged but this is rare. There are numerous treatment options and the principles are those of gentle stretches and support to the arch and heel via Insoles whilst staying reasonably active. There are a number of additional treatment options detailed below. Once a thorough assessment of your foot has been made and any unusual possible causes have been ruled out the following treatment regime is usually employed. This is best achieved by wearing comfortable supportive shoes such as trainers and wearing insoles. These do not need to be made to measure but should have a good support to the arch. I will show you some regular calf stretching exercises that you must do every day. You can see them on YouTube. Make sure you do these regularly. In most people this simple regime is enough to help significantly with the pain. If however your symptoms persist the next stage would be to consider extra corporeal shockwave treatment. This is a relatively new treatment with some excellent results. Shockwave exerts a mechanical pressure and tension force on the fascia increasing cell membrane permeability, promotes healing and subsequent dissolution of pathological calcific deposits. It requires weekly treatment with good results. More information available on the internet. This can bring about dramatic relief to your heel pain. The problem is that it might not last for a long time and there are risks associated with steroid injection. The injection of steroid which is a powerful anti inflammatory into the heel reduces the inflammation and can reduce the pain. 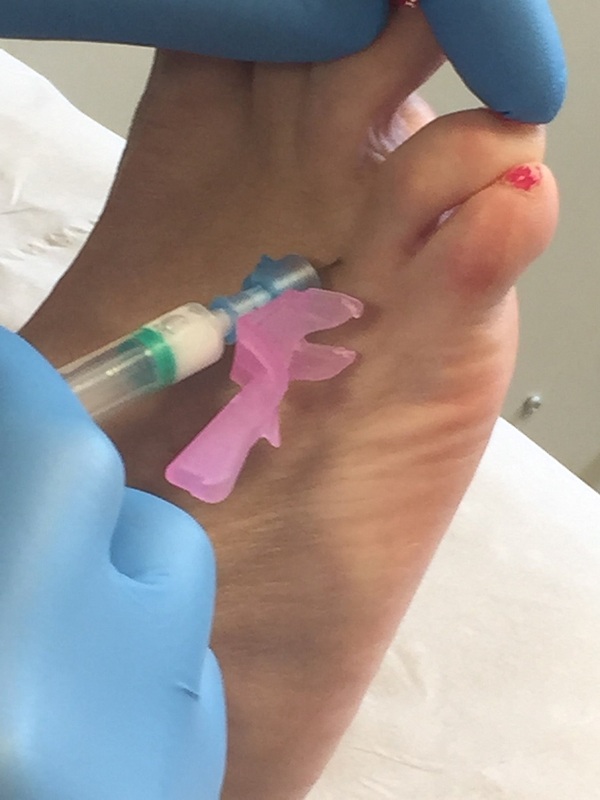 Numbing the heel before injecting the steroid significantly reduces the pain of injecting the steroid. It has been reported in the literature that the steroid can permanently thin the fat pad under the heel and this would be a major problem. I have injected the heel many times and will do this when symptoms dictate but for this reason steroids are not normally my first line of treatment. If the pain persists immobilising the heel might be required. This could be in a plaster cast or a removable walker boot. This could be for up to 6 weeks. This is very rarely needed. There are numerous surgical procedures but the basic aim is to detach a portion of the fascia from the heel bone. Should this become necessary I will discuss this with you in details. Just because you have a flat foot it doesn't mean that something needs to be done about it. Many top class athletes have flat feet and the issue is whether the flatness of your foot requires treatment. Many people come to my clinic having been told that they 'pronate' and that needs to be corrected. Pronation or rolling in of the foot is a normal function of the foot to dissipate force and adapt to different terrains. The issue is whether you hyperpronate and whether an intervention is required It is probably best to divide this topic in Juvenile, Adolescent and Adult flat foot. The first point to make is that it is essentially normal for most young children to have flat feet. This is often because the arch has fat giving the appearance of a flat foot. There are various simple tests to confirm that the arch functions and it would be rare for any intervention. Occasionally there may be an associated hypermobility syndrome and this is best evaluated by a specialist in this field. In general there should be an arch visible as the child develops at about age 4-5 years. Many people will continue to have flat feet throughout their lives. If the foot is very flat this may predispose to foot/ankle or other joint pain. Any intervention depends on the level of deformity and pain. Often moderate occasional discomfort can be treated with Orthotics both in the adolescent and adult flat foot. In teenagers there may be a variety of temporary joint pain that at one time was called 'growing pain'. These painful areas can be in the arch, heel or forefoot and can also occur at the knee and hip. The mechanism of pain and treatment for this is now better understood. This condition is called Osteochondritis dessicans and is self limiting. If however pain persists and limits activity and this has not responded to Orthotics more invasive treatment may be required. 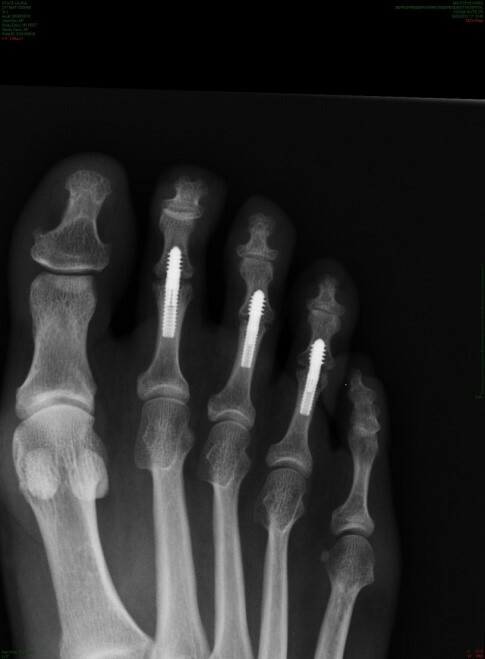 There are a number of surgical options ranging from the insertion of a HyProCure implant to corrective surgery of the midfoot or rearfoot. This relatively simple procedure involves the insertion of a stent into a canal near the ankle joint. It stops the foot from flattening excessively and can help people who suffer from foot ankle and leg pain.
. This gives a good explanation of how the sinus tarsi stent works. It is indicated for a specific group of people with flat feet. This procedure is relatively new but has a good success profile. For some people a flat foot becomes increasingly symptomatic and progressively flatter with age. If this occurs then any treatment will depend on the level of deformity and symptoms. Often people complain of aching on the inside of the ankle that happens after long walks or at the end of a game of football and in others it prevents them from doing any exercise at all. If the pain is severe and mobility restricted then corrective surgery may be required. 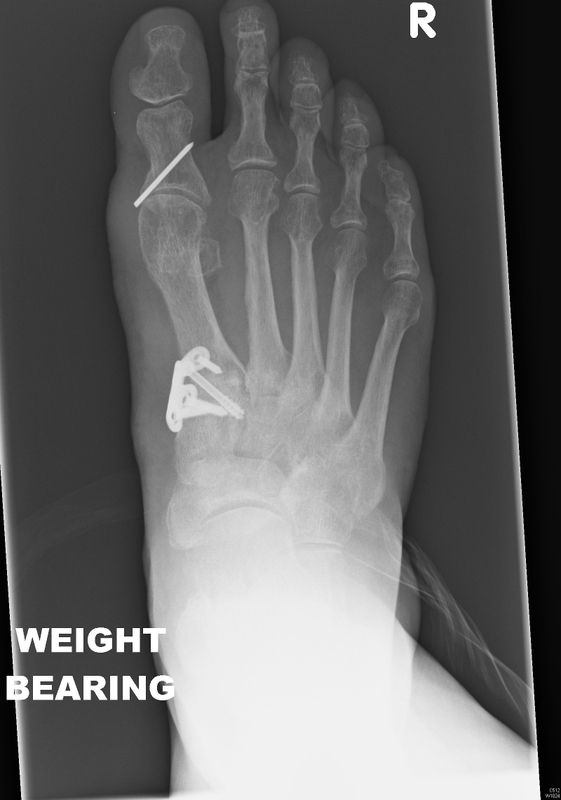 There are many surgical procedures aimed at realigning the foot and this will depend on a full assessment of your foot pathology and function. 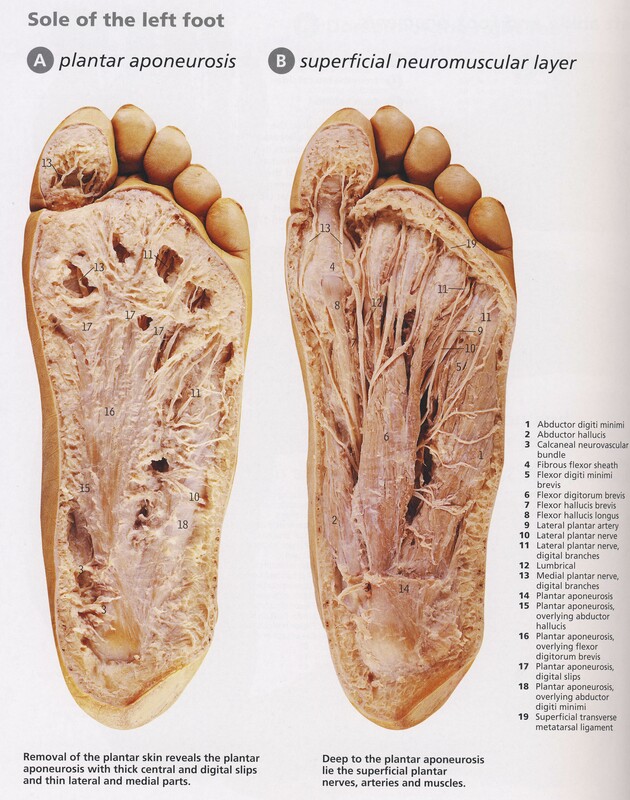 The arch of the foot is made from a complex series of bones tendons and ligaments. According to podiatric practice there is only one important arch of the foot on the medial side. The height of the arch varies and having a flat foot or high arched foot is inherited. The arch acts to dissipate forces and store energy within the foot. Most young children have flat feet and this is because the arch has fatty tissue overlying it. Normally an arch appears after the age of 5-6 years. Even if you remain flat footed this might be normal for you and your family. Just because the arch is low does not mean that any treatment is required. Many world class athletes have flat feet. If the arch is painful or the arch of one foot suddenly drops then investigation and treatment may be required. The arch might drop acutely due to a tear in a tendon or the movement of a bone within the arch. 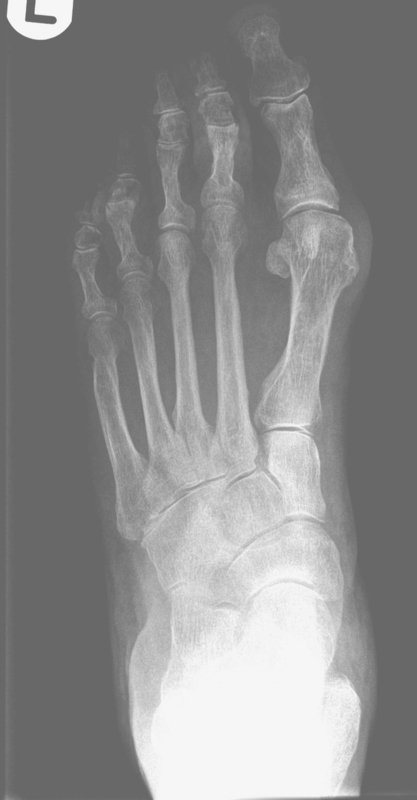 A scan and X Ray may be indicated and treatment ranging from insoles to surgery may be required. If you have a high arched foot this is likely to have been inherited. In extreme form this can cause pain in the ball of the foot and is often associated with a tight Achilles tendon and a tendency to walk on the outside of your foot. In most people there are no symptoms and in others there may pain along the arch and pain on the outside of your ankle. Both these foot types are often mild and require no treatment, but if symptoms occur a full bio-mechanical examination will often reveal a mechanical cause to your pain. Often the treatment may be simple stretches and orthoses. Tendons connect muscles to bone. They are essentially pulleys that are designed to have a relatively poor blood supply and have very high tensile strength. The constituents of tendon are called collagen and elastin and the relationship between these will determine the elasticity of the tendon. Some tendon also store energy and a good example of this are kangaroo leg tendons that are important in storing and releasing energy. For a variety of reasons they can become damaged. This could be due to trauma, repetitive stress, or unexpected demands put on them. Often a tendon is pulled beyond its range of elastic recoil and this will lead to damage within the tendon or of the sheath that surrounds then tendon. With age the quality of the tendons can reduce and they are often affected by certain types of arthritis and connective tissue diseases. Very occasionally tendons can be affected by antibiotics and other drugs. The management of tendon pathology depends on which tendon is affected and the level of damage. A combination of rest and gentle exercise is required. Physiotherapy is often indicated and there are a variety of ultrasound and other therapies that can help including Extra Corporeal Shock Wave Treatment. If however, the tendon has a tear or has ruptured surgical repair may be required. The correct treatment will depend on a careful history, thorough assessment of foot bio-mechanics and the relevant imaging. Once a diagnosis is confirmed a treatment plan can be formulated. This might include conservative or surgical repair of the tendon. 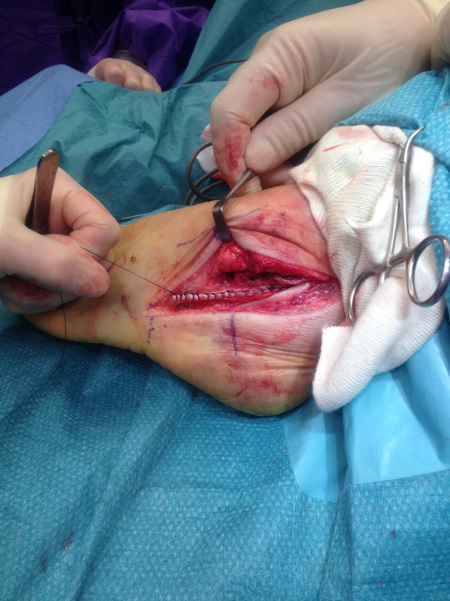 Below are some pictures of damaged tendon before and after surgery. Because the blood supply is poor tendons take a relatively long time to heal and often plaster casts are required. This will depend on the level of damage and the surgery required. Sometimes the tendon becomes strained due to excess adjacent joint mobility and in this situation fusion of the problematic joint might be required. Often the nature of the pain gives an indication as to the cause. Often a sharp pain suggests that a nerve might be compressed. A dull ache often suggests that a joint is overloaded. In some people the cause could be due to an overloaded or long metatarsal head. If there is swelling on top of the foot this could be due to a stress reaction or fracture. Since many of these conditions overlap there may be a combination of pathologies causing your pain and this may require various tests to clarify along with a thorough assessment of your history and any contributory factors. 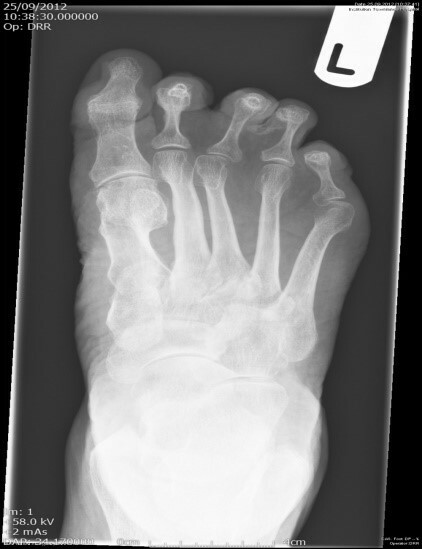 Often an initial X Ray is arranged to look at the general outline of your foot bones. X Ray however does not show mild stress reaction certain types of arthritis or soft tissue pathology so an MRI or Ultrasound might also be required. Usually these tests will clarify the cause of your pain and treatment can begin. 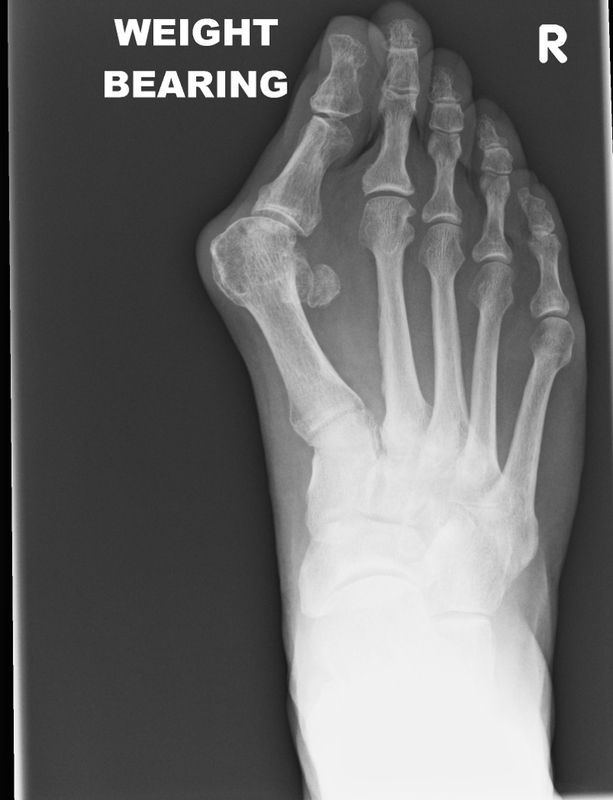 Sometimes there may be an underlying bio-mechanical issue such as a relatively long metatarsal which becomes overloaded and subsequently painful. This depends on the symptoms that you present with but there are a number of conservative and surgical options available to treat Metatatrsalgia. These range from insoles to steroid injections, immobilisation to possible surgery. 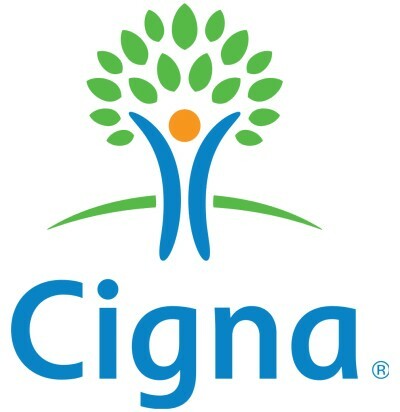 I will details these options to you so that we can make an informed decision together on the best treatment for you. Picture showing the relative length of the metatarsals. 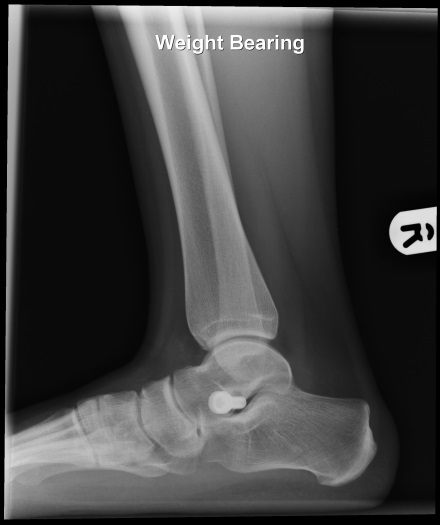 This affects force taken through the foot and is an important feature when planning surgery. 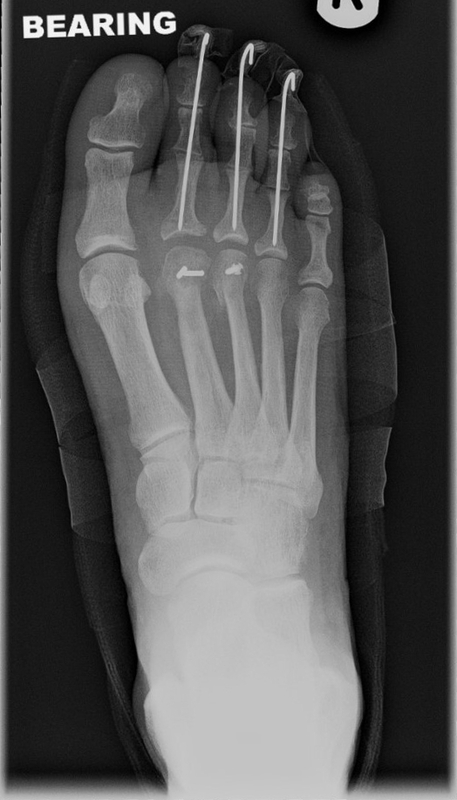 If the metatarsals are too long surgery can be performed to shorten them as seen in the X Ray below. Some people have a relatively long metatarsal bone which become the focus of excess pressure and subsequent pain. On this X Ray the 2nd metatarsal is longer than usual. This condition is characterised by a burning pain in the ball of your foot. This was apparently first described by an English Podiatrist in 1845 but ultimately named after an American surgeon in 1876. The 'Neuroma' is a swelling of the nerve under your foot just before the toe web-space. When you walk the nerve is 'pinched' and this often causes a burning pain that in many people radiates to the toes. Wearing a narrow or high heel shoe often aggravates the pain. Sometimes the pain is due to a swollen bursa (sac of fluid) pressing on the nerve. The treatment for both conditions (Neuroma/Bursa) is often the same. The level and frequency of pain varies but often the neuroma can be present without causing any symptoms. Frequently the symptoms of a Mortons Neuroma are classic and the diagnosis is made clinically. If needed this is confirmed with an MRI or Ultrasound scan that images the soft tissue swelling. An X Ray does not normally provide useful information. Often to confirm the diagnosis you will have a diagnostic local anaesthetic block into the swollen nerve. This should temporarily ease the pain and is a very useful method to confirm the diagnosis. Should these other therapies fail surgery is often required. Usually the swollen nerve/bursa is excised via a relatively small incision on the top of your foot near the web space. The nerve actually sits in the ball of your foot but it is best to avoid operating from the sole of your foot if possible. If you are having several nerves removed you will need several incisions. Once the nerve is identified it is carefully removed making sure that there are no nerve fibres remaining. The wound is then closed in layers. The operation takes about 30 minutes. The removed piece of nerve is sent for inspection. This is standard practice. Post operative pain is usually very mild with this kind of procedure. It is important however to rest adequately in order that the wound will heal uneventfully. There are plenty of research papers confirming good results with neuroma surgery. There are possible complications but fortunately these are rare. Managing digital deformity can be surprisingly difficult. 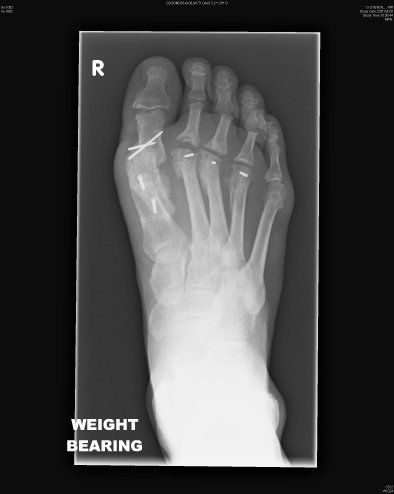 The margin of error, when surgically realigning toes is small, and dealing with small bones is often more difficult than operating on larger ones. Much however can be done to realign toes and managing digital deformity surgically forms a large part of my practice. There are new fixation techniques available for some people that will allow for early return to normal activities. In this section I will deal with common digital deformity and its management. 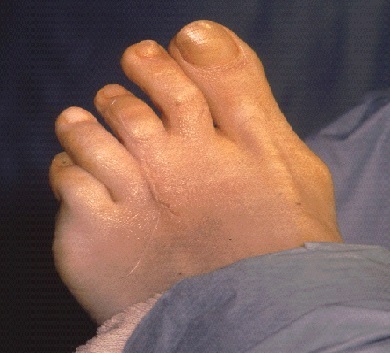 Hammer toe deformity occurs when the toe has buckled. This leads to pressure on the toe from shoes and often to a painful corn or possible ulcer on the toe. Often the toe deforms as a result of a coexisting bunion deformity but it can also occur in isolation. There are several surgical procedures to either remove the buckled joint or to fuse it into a corrected position. If the deformity is mobile it can in some people be corrected via special insoles (orthoses) and relevant stretching exercises. If, however, the small joints have fused or are very stiff realistically surgery is the only curative option. If there is a coexisting bunion deformity the big toe might be responsible for the hammering of the second toe and bunion surgery will be required. Clearly shoes play an important role in the development of a hammer toe deformity. In many people the second toe is longer than the big toe and this gets squeezed and deformed especially if the shoe is narrow. With fusion surgery the ends of the bones are aligned and temporarily fixed with K wires until the bones are healed. The wires are usually removed at 6 weeks and this process is done in out patients with minimal discomfort. 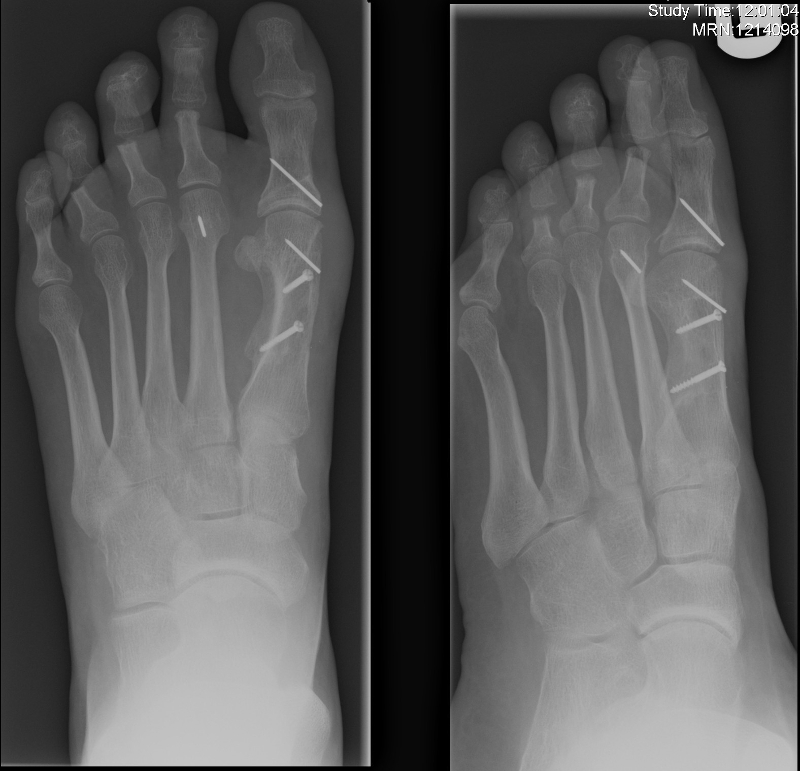 When there is painful splaying of the toes small wedges of bone can be removed to realign the digits into better alignment. This operation is indicated if your toes are overlapping or squashed together. Sometimes this occurs as a result of the big toe pressing onto the lesser toes and sometimes it can happen because of damage to the position of the toes from trauma or inflammation of the joints. By taking wedges of bone from the toes these can be straightened and temporarily held in place by wire which are removed at 6 weeks. In the case below the 2nd and 3rd toes were pressing on each other and painful. By removing a wedge of bone from the 3rd toe these are now straight and pain free. The wire will be removed at 6 weeks. This lady also had early “wear and tear” of the big toe joint and had surgery to realign the articulating cartilage. In adults splinting the toes is unlikely to realign a long term deformity. There is no evidence that this will help in children but is certainly worth trying although any benefit will take many months to reveal itself. In general there is no indication to realign the toes unless they are painful. All surgery has the potential for complications. Sometimes pain in the toes can be due to torn ligaments or trapped nerves in the foot and careful history taking and examination is crucial in making the correct diagnosis. I have realigned many thousands of deformed toes and am always pleased to see the expression of delight when the dressings are removed to reveal the nicely aligned digits following surgery. Achilles Tendinopathy is a common condition. Sometime associated with sport but often without any history of trauma or sport the back of the heel cord swells and becomes painful. Often this is worse on first weight bearing and after rest. There are certain foot types that can predispose to Achilles tendon pain and often recovery from this is lengthy but in most cases the pain will settle. The tendon becomes swollen and tender to palpation. If there is a total rupture then it is almost impossible to walk and urgent repair is required. Once the pathology is confirmed treatment can begin. This depends on whether surgical repair is required but this is relatively rare. For most people management is a combination of rest/gentle exercise, physiotherapy and possible Orthotics. 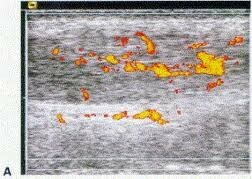 I use this treatment regularly for tendon pathology, there is a lot of information about this treatment available. This is a somewhat controversial treatment and not something that I personally carry out. More information can be found here. In general with rest, physiotherapy and insoles most people's pain resolves but for the long term Orthotics might prevent recurrence and are worth considering. This presents a particular clinical interest for me. 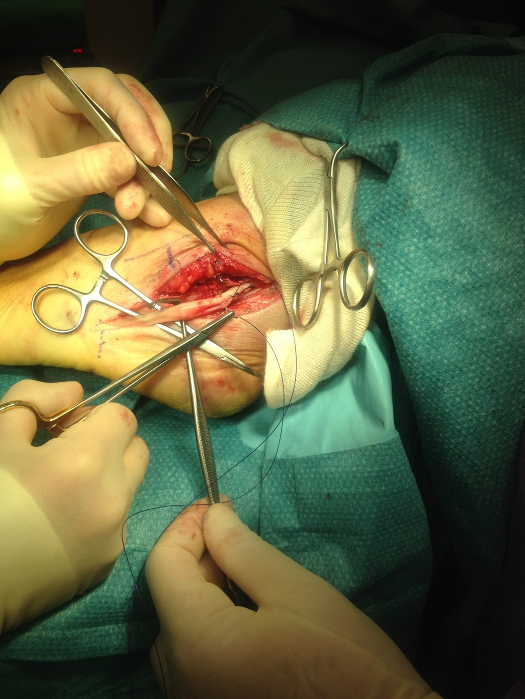 Management of the Rheumatoid foot poses a surgical challenge. Those who have this inflammatory disease know that stiffness and pain can be a frequent problem. The medical management of this disease has made huge advances especially with the introduction of new biological agents. Nevertheless there are still many people who require multiple joint procedures to address the damage that can be done by the ongoing swelling and joint destruction. In many cases the question is at what point is foot surgery required. Many people with Rheumatoid Arthritis have marked deformity but little pain, others clearly have pain and injection treatments or surgery is required. The level of surgery will naturally depend on the presenting complaint. 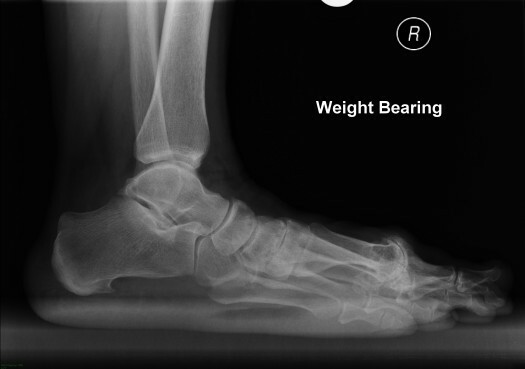 Below are some X Rays demonstrating the correction achievable in the forefoot. At one time all forefoot surgery involved simply removing the painful joints but the evidence is that pain and deformity will probably recur after about 10 years, so if it is possible to reconstruct the forefoot that would seem to be the better surgical option. The introduction of custom orthoses generated a lot of excitement and debate within the profession. 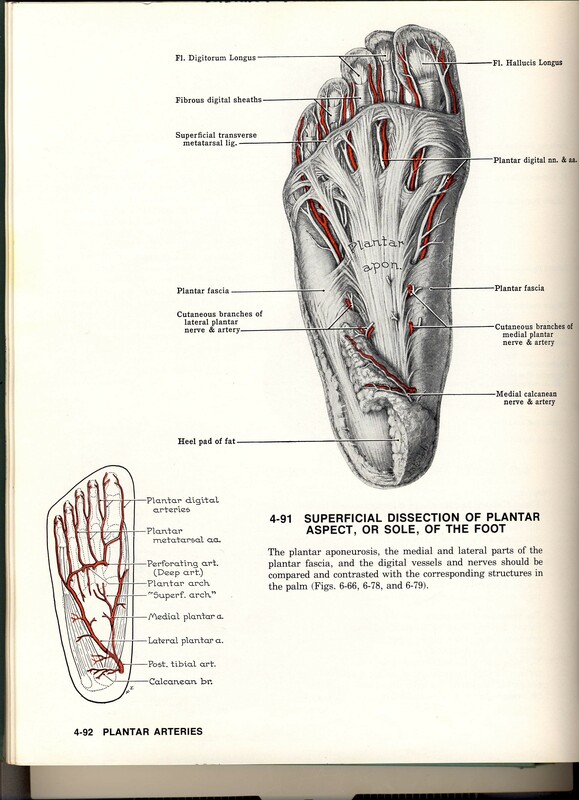 This changed the concept of an 'insole' into something more scientific and was based on a deeper understanding of the biomechanics of the foot. The ground breaking work on foot biomechanics was developed in California in the late 1960's and has been taken up with enthusiasm by many British Podiatrists. The manufacture of an orthosis is based on an accurate measurement of the relationship between joints both within the foot and between the foot and leg. Purists declared that very minor adjustments to an orthosis could have a major effect on the function of the foot and leg and solve many mechanical lower limb problems. Over the years some of this rash enthusiasm has been tempered. 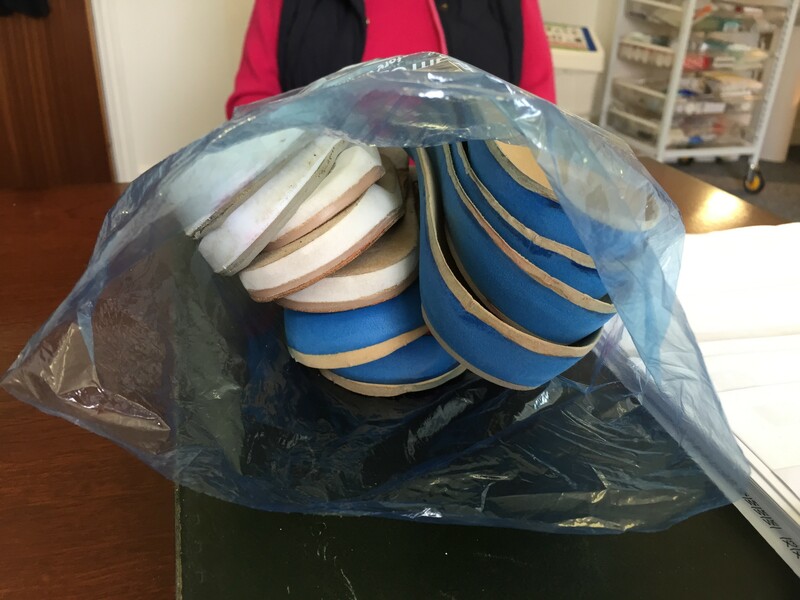 Certainly there is a place for custom orthoses in the management of a wide variety of foot and lower limb complaints but they do have their limits and are not successful for all problems. Functional orthoses (ie those that change foot function) can only be usefully used when the foot is mobile. In many cases there is no evidence to support their use as in the fact that they will not reverse a bunion deformity and will not help with trapped nerves in the foot. They provide a useful function in the Diabetic and Rheumatoid foot. They can support a very flat foot and should probably be considered before proceeding with major reconstructive flat foot surgery. 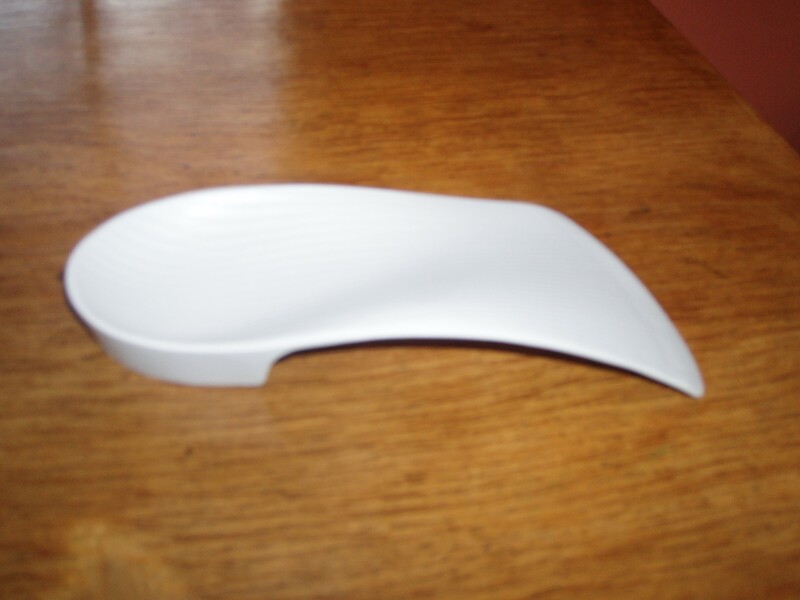 In general a custom orthosis is manufactured from a plaster cast taken of your foot in a corrected position. This is sent to a factory where the orthosis is manufactured. Clearly these need to fit into everyday shoes and I have worked for many years with a factory that can provide a slimline functional orthosis. 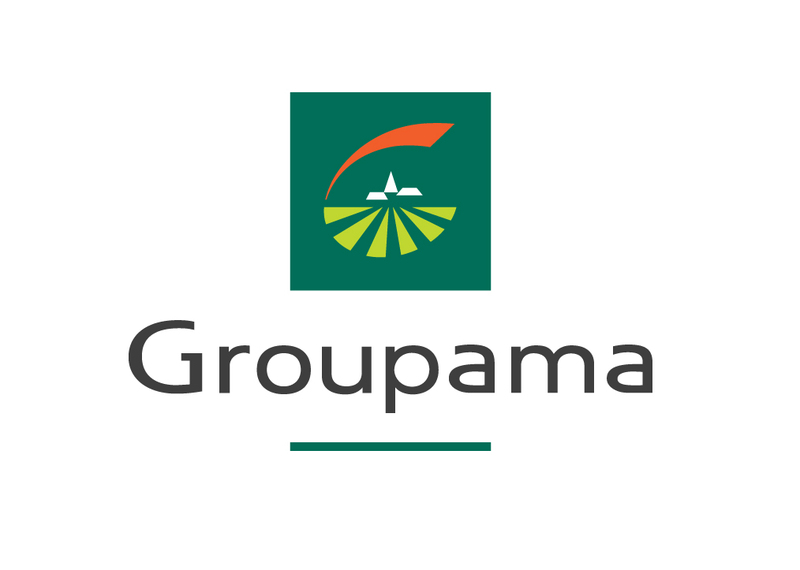 I am happy to discuss their indication and use as they do have an important role in the management of the painful foot but form a part of an array of treatments available. There are numerous over the counter insoles available. Some are more useful than others. Many people try insoles that simply have very little function ande are better described as shoe fillers. Some commercially available insoles give excellent benefit and can offer immediate relief for an acutely painful foot. The question is whether there is an underlying biomechanical problem that needs to be addressed or whether this is a 'one-off' acute episode of pain that will settle. This should be assessed by an appropriately trained practitioner. In general over the counter insoles should not be too rigid as these change the posture of the foot and this could in theory exacerbate the problem. For that reason I would recommend that an initial diagnosis should be made by a professional who can then advise on the most appropriate orthosis whether custom made or commercially available. There are numerous products available and some patients arrive in clinic with bags of expensive and unsuitable insoles. These products are widely advertised on the internet and newspapers and have a variable record as to effectiveness and in some cases are clearly never going to resolve the presenting problem. There are many foot and ankle conditions that can be resolved with steroid or other injections. There is a common perception that all steroid injections are temporary but this is not always the case. Often it is important to try to resolve a problem with a steroid injection before considering other interventions including surgery. 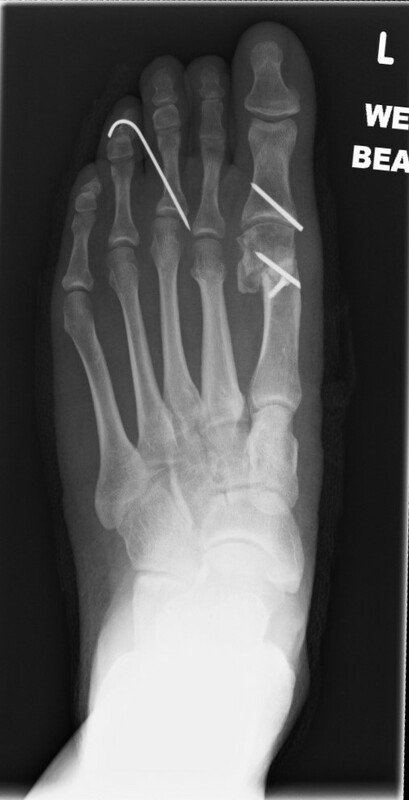 Some acute conditions following sport or trauma can respond permanently to steroid injections but others related to foot mechanics or bony alignment may ultimately require surgery. I have detailed below those conditions that I consider to be appropriate to steroid injections but also many people have concerns about steroid injections and what effect this could have on the body. The simple answer to this is that in a healthy person who has no relevant medical history steroids are not going to have a systemic effect. Single or even multiple joint injections will not have an effect on bone or muscles in general as long as they are not used regularly or repeatedly. Occasionally they can have a local effect on tissue and I will explain this to you before we consider an injection. It is true that repeat injections are not healthy but as an initial trial it would certainly be indicated for many conditions. Some of the concerns about injectable steroids are based on minimal information. Of course there are also websites suggesting how bad injectable steroids are but in my experience given for the appropriate conditions they have a lot to offer with few side effects. What conditions are injectable steroids useful in? Essentially any soft tissue condition in which there is an inflammatory component. Plantar fasciitis. This condition is discussed elsewhere on the website. The underlying pathology is a traction of the fascia under the heel. If stretches and insoles fail then steroid injection provides a further treatment option. 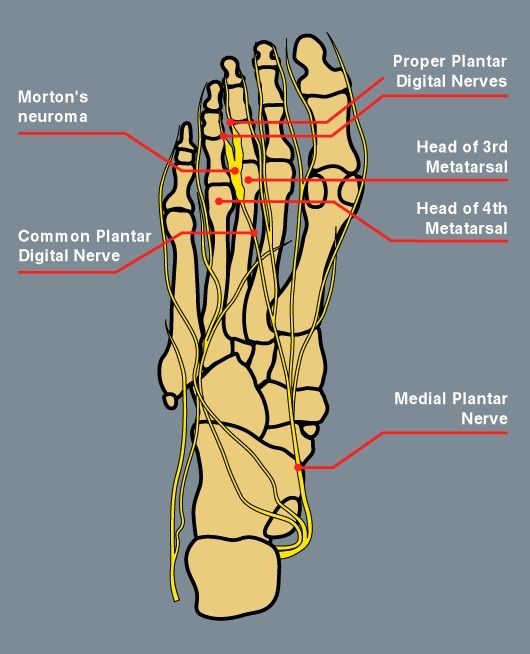 Mortons Neuroma is a condition in which a nerve in the ball of the foot becomes tethered and inflamed and steroid injection can often resolve this condition. Inflammatory Arthritis. Any joint inflammation related to many different types of arthritis can respond well to steroid injection. Tendon pathology. Steroid injection for tendon problems requires caution and proper investigation but in specific cases it can reduce pain and swelling. Osteoarthritis. In theory steroids should not be used for degenerative joint disease but in practice there is often an inflammatory component to the pain which can be helped with steroid injection. There are other materials that can be injected and I have used Ostenil in ankle and big toe joints with good benefit. The injection is given usually in the out patient clinic and occasionally I will refer or do this under ultrasound guidance. After a steroid injection I usually recommend 24 hours rest to the steroid the best possible chance to work. 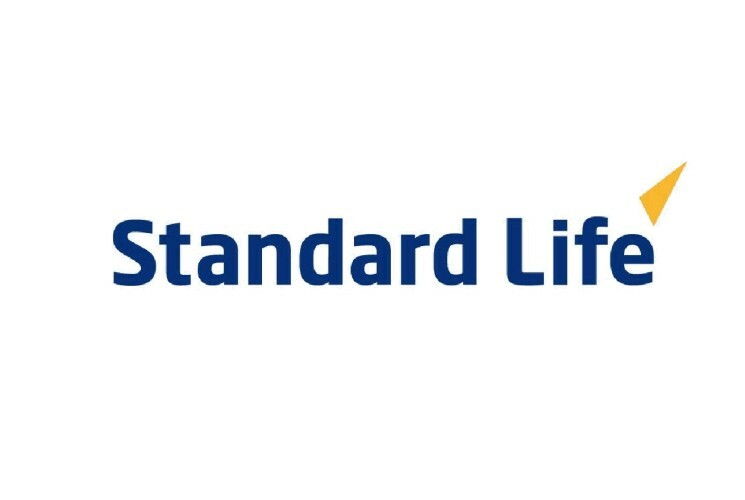 The issue is not to rule treatments out without considering their risk/benefit profile and there is no doubt that steroid or other injections have their place in the management of foot and ankle pain. After 35 years working in the NHS, I have now retired from my NHS practice. The information below is given purely as a record. For further queries and to book appointments, please use the relevant contact information below. 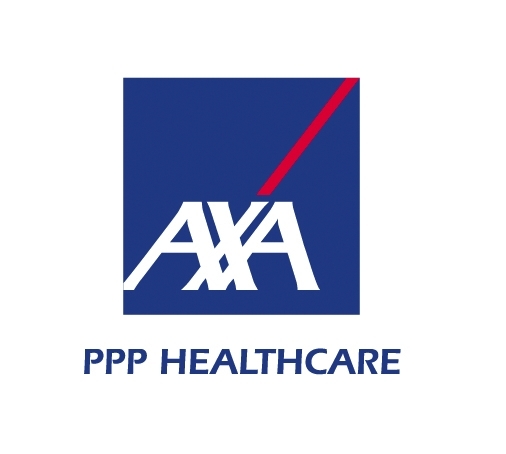 Most private insurance companies cover Consultant Podiatric Surgeons. The level of cover varies depending on your own policy and the condition that you are presenting with. None of the insurance companies will pay for Custom made orthoses (insoles). 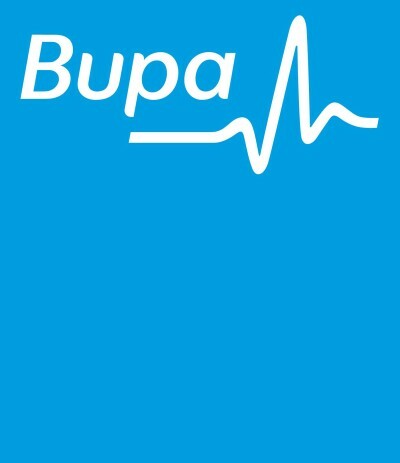 In general they will pay for consultations, investigations and treatment either in an out patient or inpatient setting. It is always useful to confirm the cover that you have and my secretary will be happy to discuss this with you. 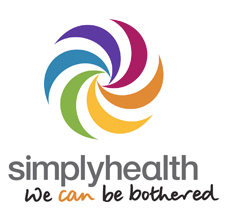 You will require a GP referral and need to arrange for the consultation to be authorised.